There have been a few Twitter and Google Maps mashups but Stweet is the first to show Twitter messages on Street View. 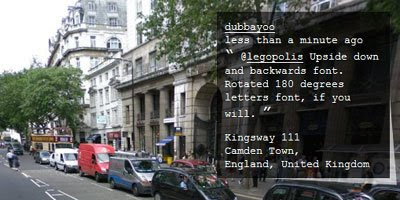 Stweet displays geolocalised tweets from Twitter on top of a Google Street View panorama. The Street View image refreshes for each new Tweet. Stweet is obviously only available in cities that currently have Street View coverage. However it is possible to search for messages in a number of cities around the world by selecting from a drop down menu.